At this time of year most tutor/mentor programs are busy recruiting volunteers and students for the coming school year. 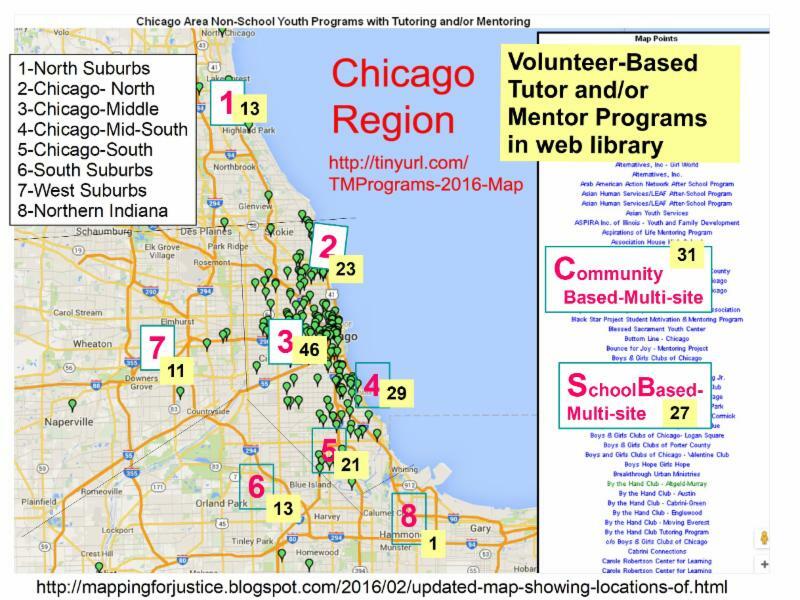 Here's a map showing locations of non-school, tutor and/or mentor program in the Chicago region. All of these organizations are recruiting volunteers right now. Anyone can help them! Just click on the green icons to get contact information and web site addresses. Then go to the web site and learn what the program does. Find their volunteer recruitment page and share that with your friends, family and co-workers, using social media, and/or traditional media. As more people take this role more volunteers, and donors, will help these programs reach youth throughout the Chicago region. Here's a fun way students and volunteers can help draw attention to tutor/mentor programs. I created these graphics using the free http://textanim.com resource. Then I posted them on Twitter in a Tweet to each of the programs. 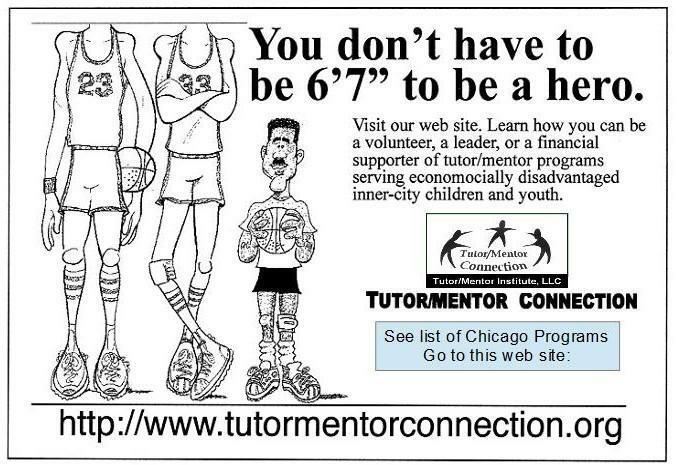 I said "pass it on" and encouraged them to create a similar graphic for another tutor/mentor program in Chicago. 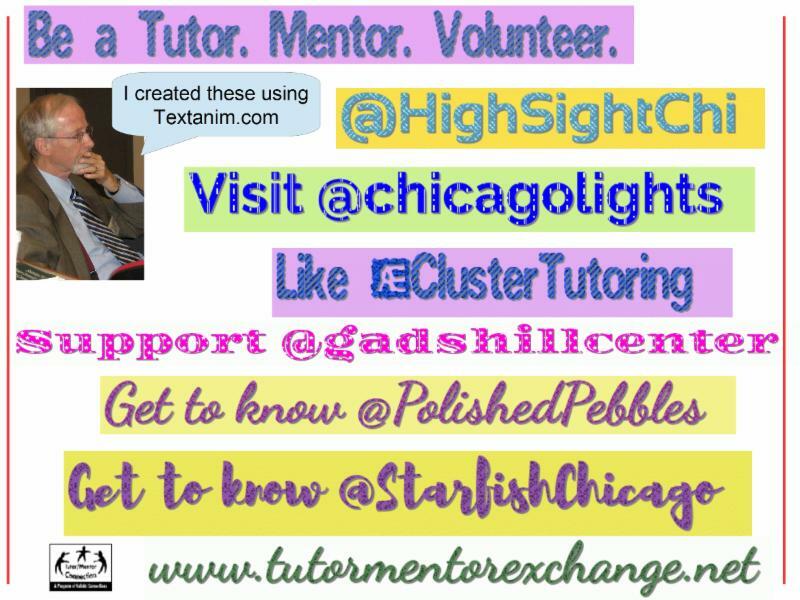 You an your students can create all sorts of graphics and animations and post them in an effort to draw attention and volunteers (and donors) to you and every other tutor/mentor program in Chicago....or any other city. Resources to use to find volunteer and donor opportunities with Tutor and Mentor organizations. You need to provide training and on-going support to keep them involved. 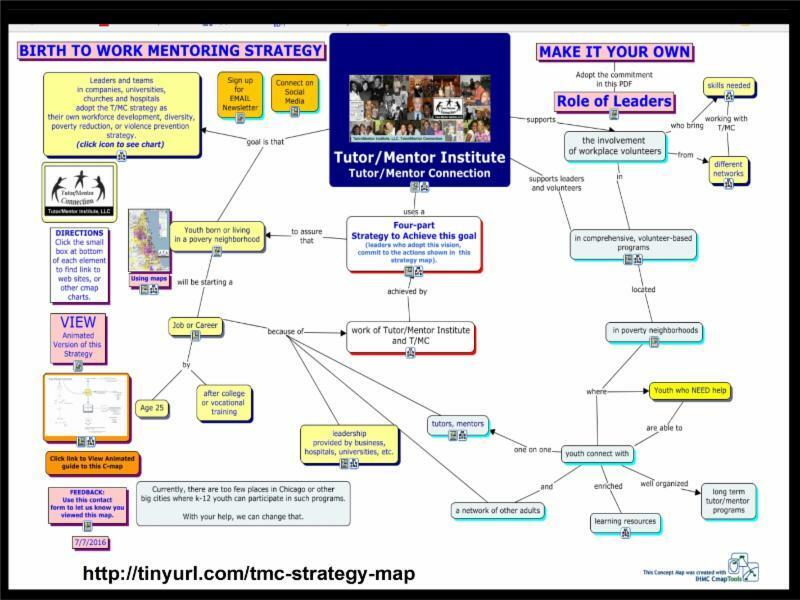 In the article I point to above I include this is concept map showing different types of homework and learning support resources that you can find in the Tutor/Mentor web library. Point your students and volunteers to these resources and find ways to motivate them to dig into them, learn to use them, and to share what they are finding with others in your program. In another section of the web library you can find volunteer training resources and in another section fund raising ideas and resources. Learning from others is on-going. 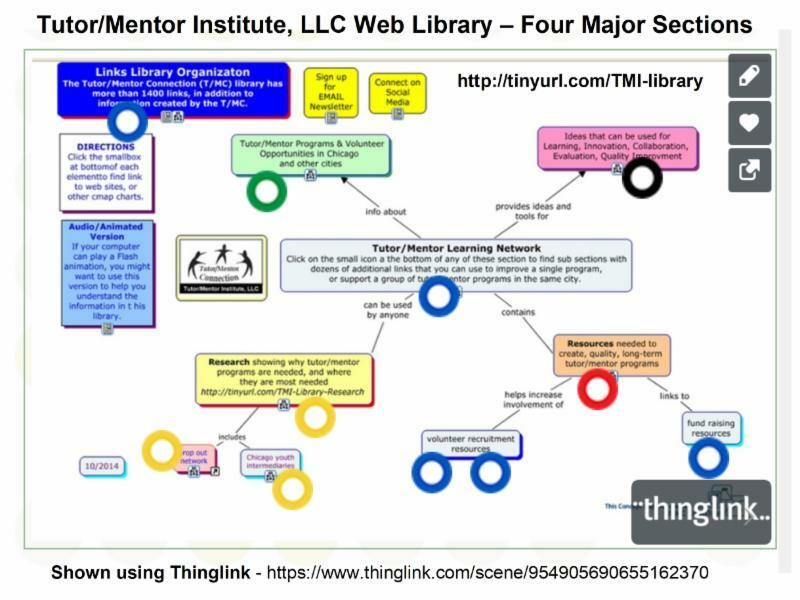 The graphic at the right shows the four sections of the Tutor/Mentor web library that I started building even before going on the Internet. It also demonstrates a web tool called Thinglink, that enables you to draw attention to different elements of the graphic with pop-up messages. See at this link.  The resources in the web library are intended to support on-going learning by everyone involved with helping young people move through school and into jobs and careers. Finding ways to draw attention to this information is an on-going challenge. Engaging youth and volunteers in this effort offers learning opportunities and extra engagement opportunities. Navigating the web library I've created over the past 20 years can be challenging. I created this page, with links to many sub sections of the library and articles I point to frequently. This video highlights this list. Try it with some of the information on your own web site. Involve your students in communicating program design and strategy. 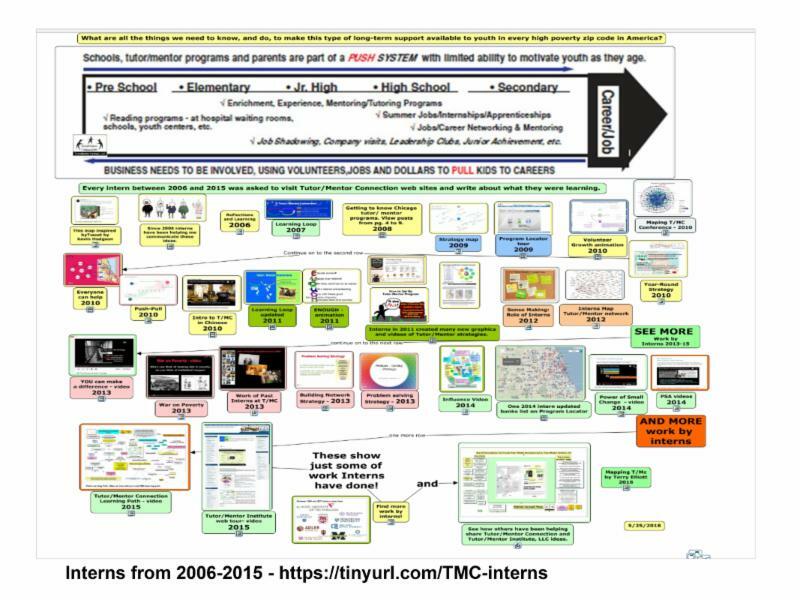 Visit this concept map to see how interns have converted Tutor/Mentor strategy ideas into videos and other visualizations. Youth and volunteers from many places are encouraged to do this. Focus the ideas on your own community if you're not from the Chicago region. Building long-term support for youth, and the organizations who serve them. 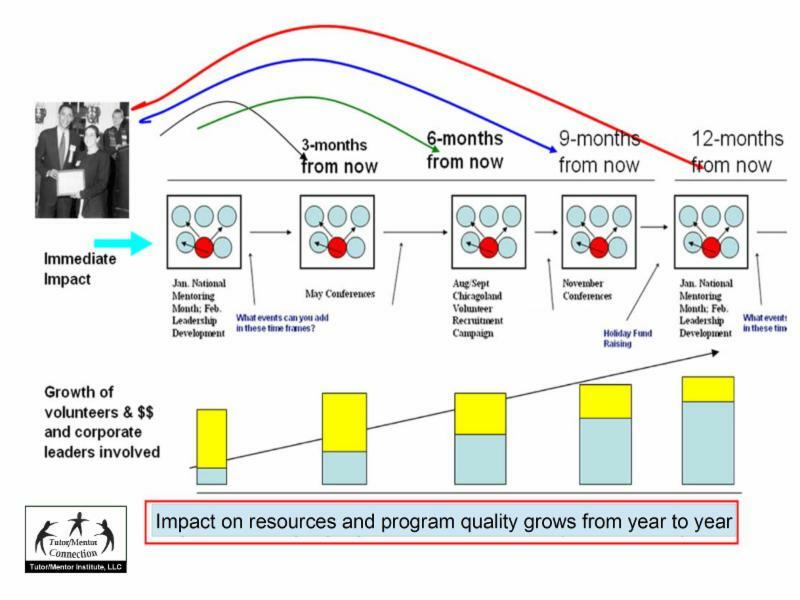 Finding on-going funding and talent who will stay with a program for many years is one of the primary challenges facing many tutor/mentor programs. 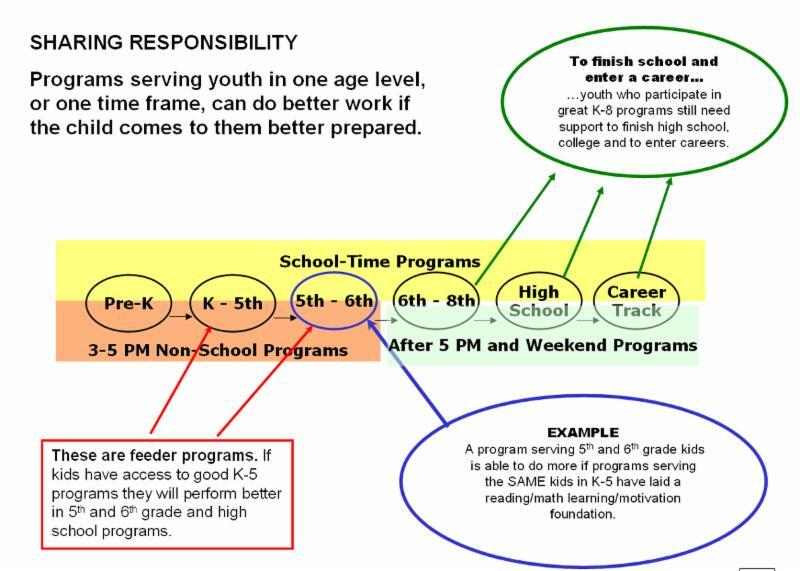 I've used a variety of graphics to focus attention on the long-term support kids need to move through school and into adult lives. Visit this Pinterest board and see some of them. In articles like this I focus on the on-going flow of flexible operating dollars, talent and technology that is needed at every youth serving program that has a long-term vision. I've been using maps since 1994 to focus attention on all high poverty neighborhoods of Chicago where birth-to-work youth support systems are needed. I've also used maps to follow up after media stories focus on violence and other indicators that kids and families need extra help. 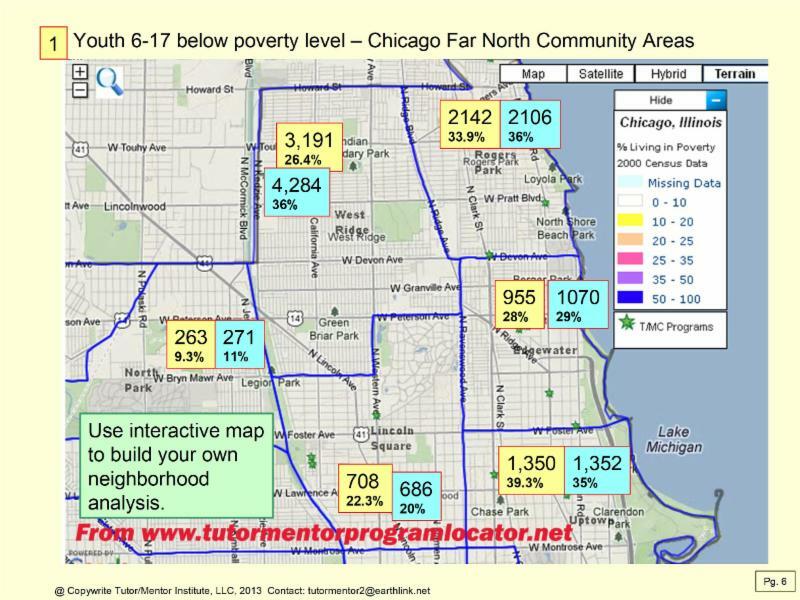 In this map presentation I show the number of high poverty kids, age 6-17, live in different Chicago Community areas. If there are 1000 or more kids in an area, how many tutor/mentor programs would be needed just to reach one-third of them? See recent blow articles which are examples of using maps in stories. Browse articles at MappingforJustice blog and see many different platforms that you can use to create map stories for blog articles and community mobilization. I'm only one person. 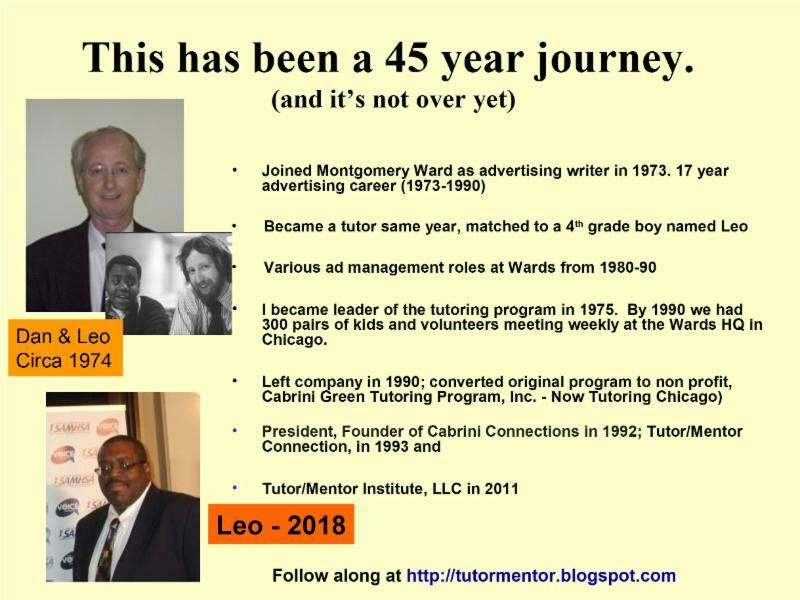 The Tutor/Mentor Connection was never a large organization. 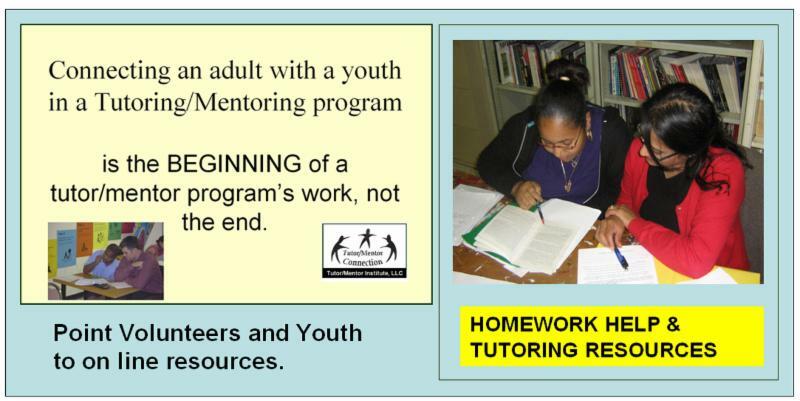 Since 2011 I've operated as Tutor/Mentor Institute, LLC, with even less funding and fewer people helping. Thus, unless many people are sharing my stories, or creating their own articles, include graphics showing their strategies and program design, and maps showing where they are most needed, too few will see this message and offer their own support. If you're interested in building maps and graphics into your communications strategy, let's connect. I can mentor you in this process. Open this link to view the map above. Follow the lines on this concept map. Is this a commitment you and others in your community agree with? 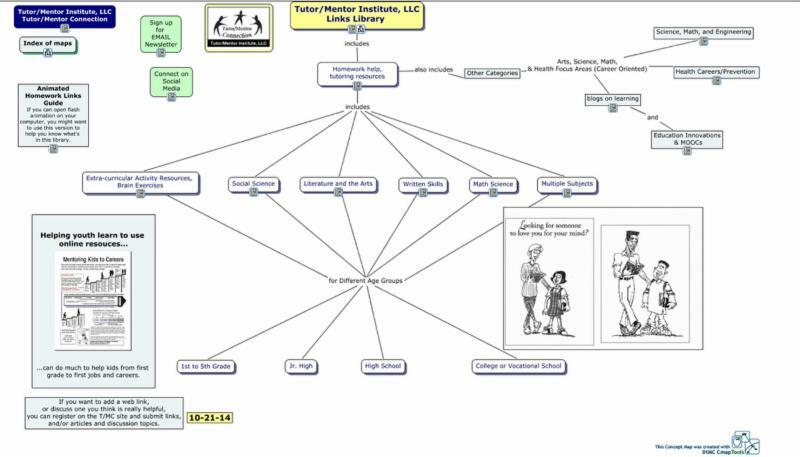 In this graphic I show myself in 1973 when I first became a tutor, along with the 4th grade boy I was matched with. Below is that boy as he approached his 50th birthday. He has inspired me in the work I've done to help tutor/mentor programs grow in many places. In this video I point to a letter he sent in 2006. And, in this link, I point to an interview Leo and I did a couple of years ago. I've written more than 1000 blog articles since 2005 and with the help of interns, have produced a library of videos. All contain information that others can use to help build and sustain well organized tutor/mentor programs in more places. These articles and strategies apply in any city, not just Chicago. View this short video to see how you can identify the most recent additions to this web library.